As a homemaker you may try to keep some sort of schedule, but have you noticed that it changes day to day a lot of the time? I know I have. As much as I would like our days to be perfectly laid out and predictable, that doesn't happen all that often. For that reason (among others), I find it really helpful to have a planner. A planner is a place to plan your day--what things you need to clean, phone calls you need to make, what you need to teach your children, and whatever other tasks you need to remind yourself of. That is why I was so grateful when Sue Hooley of Homemaker's Friend invited me to review her 2014 Daily planner and host a giveaway. Sue is a mother of six and understands how a homemaker's plans can change day to day and also understands how important it is to have a plan. This planner is really practical, and beautiful, as I'm sure you can tell by the front cover. It is also designed for homemakers! The inside pages are a pretty lavender color. You can have a look at some of the pages here. The planner is spiral bound with a laminated cover for ease of use and durability. It could easily fit into a roomy purse at 6 X 8 1/2". I really love these features because they make the planner extremely portable. The planner includes several different sections which are all tabbed for convenience. It has a weekly lay-out with a two-page spread with lines for making entries on each day. There is also space for menu planning and a to-do list. Also included are monthly calendars which have a two page per month view. It includes both 2014 and 2015 calendars with space for notes. There are perforated shopping lists which make it easy to write and then tear out when you go shopping. There are also task list and project and events sections. These have untitled pages for you to customize for your own duties and ideas. I especially love that this planner comes with instructions in the front about how to use it! There are many planners out there with no instructions, but this one gives you several ideas on how to best use it. 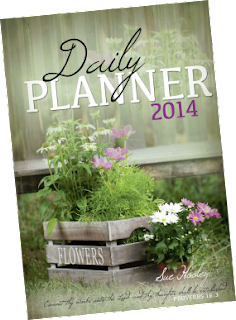 Sue is generously giving one 2014 Daily Planner to a Blessed Homemaking reader (thank you, Sue)! To enter to win, just fill out the Rafflecopter form below. Of course if you don't want to wait, you can purchase the planner here! I love any tools that help to keep me organized! Do all things decently and in order! Thank you for the chance to win one! God bless! I would love to win this because I forgot to order my planner for this year. I seriously need a lot of help to keep organized! Looking for a planner for next year. This would be great! This! Is! PERFECT! 2014 is the year I plan to get organized and keep track of EVERYTHING! So this is something I could really, really use! AND the lovely color is my FAVORITE! So! Excited!! I haven't been able to find a planner I like.I just use a small notebook and that's not working anymore. Thanks for the chance to win one. I am a planner junkie! I would love to try out this system! I'd love to win the planner to get myself organized! My planner is my sanity! I get through them and use every scrap of space, they become like dear friends. It would be so cool to have one from across the Pond, to start the New Year. Love and blessings to you, Mrs Q. May you have a wonderful 2014. I need something to help me to be more organized.